On May 3rd, Pittsfield Township residents voted to approve the 1.95 Public Safety Millage that will be effective 2012-2021. View the PDF of the Public Safety Millage Forum presentation. The reason we are asking for a higher millage is to compensate for declining revenues and a commitment to maintaining existing level of services. 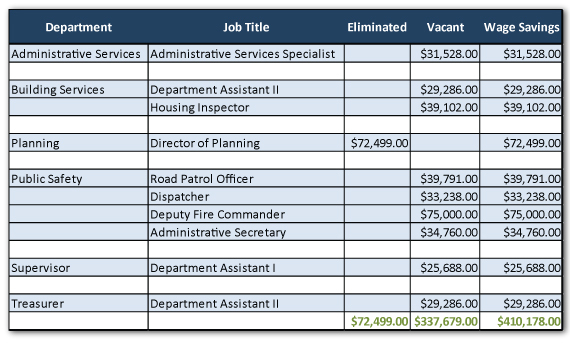 Nearly 60% of the cost for police, fire and dispatch services is drawn from the Township's General Fund. The ability to continue supporting public safety services at this level has been severely compromised in recent years because of cutbacks in revenue sharing by the state, fall interest revenues, and a general fund that was burdened, in the last 10 years, by debt as a result of numerous land purcahses. The remaining 40% is drawn from the Public Safety Millage Fund (which is currently set at 1.0 mill and expires this year.) 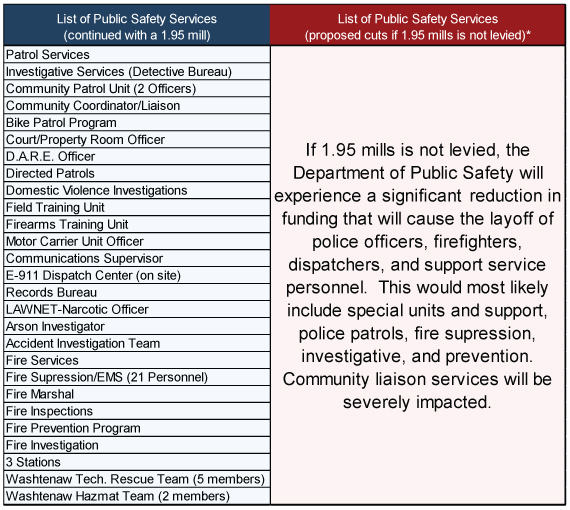 As a result of the General Fund's reduced ability to support public safety services, the costs have been shifting over to the Public Safety Millage in the last few years, which is going to need more revenues to maintain existing level of services. ** This is all-inclusive; including costs for equipment, vehicles, maintenance, and personnel. How does 1.95 mills impact my budget? On average, residents are paying $8.54/month for a 1.0 mill. With 1.95 mill, you will pay, on average, $16.66/month. This amounts to a difference of about $8/month. The 1.95 mill translates to 54¢ a day. How does Pittsfield Township Compare? Pittsfield Township has one of the lowest crime rates in Washtenaw County AND one of the lowest costs of providing public safety services. *In a show of partnership and commitment to maintaining existing level of services, most public safety personnel accepted 0% wage increases. Union contracts were settled in 2010, within a period of six months, for five years. What Services Can I Expect with 1.95 mills? which could be as much as 10% per household per year. At a time when most communities are seeing an increase in crime, crime rates in Pittsfield Township have declined in the past two years because of our heavy engagement with the community and a focus on crime prevention. In order to continue providing you with one of the cheapest and most responsive police, fire, and dispatch services that ensure one of the lowest crime rates in Washtenaw, we require 1.95 mills.